Has any one built or considered building a CC to PC converter? I've got a Boss GT 100 and it can only send PC changes when you select a patch. My Blackstar Series One Amp happily receives PC changes. The Boss can send CC messages from within a patch and what I'd like to do though is change amp channels from within a patch. That should be simple to do with an Arduino. You'd need a MIDI shield of some sort (haven't looked, but there must be plenty of those). There's certainly library functions that do most of the MIDI nitty-gritty for you. After that, it'd be a question of keeping track of what's coming in, spotting the message(s) you're interested in, and sending the other one(s) instead. Eminently do-able. Go for it. ... You'd need a MIDI shield of some sort (haven't looked, but there must be plenty of those). Easy enough to roll your own, too. Coupla 5-pin jacks, optocouplers, and resistors, and a bit of perfboard, and wahla. It's a perfect project for a small arduino. You don't even need any shield, just some resistors and an optocoupler will do the trick. There are a couple of MIDI libraries ready to be used that you can grab. I can help with the software changes, drop me a message if you want me to help. I'm a bit confused, will I need the opto - isolators or can the Midi sockets connect straight on to the board? In order to meet the MIDI spec, the IN needs an optoisolator. 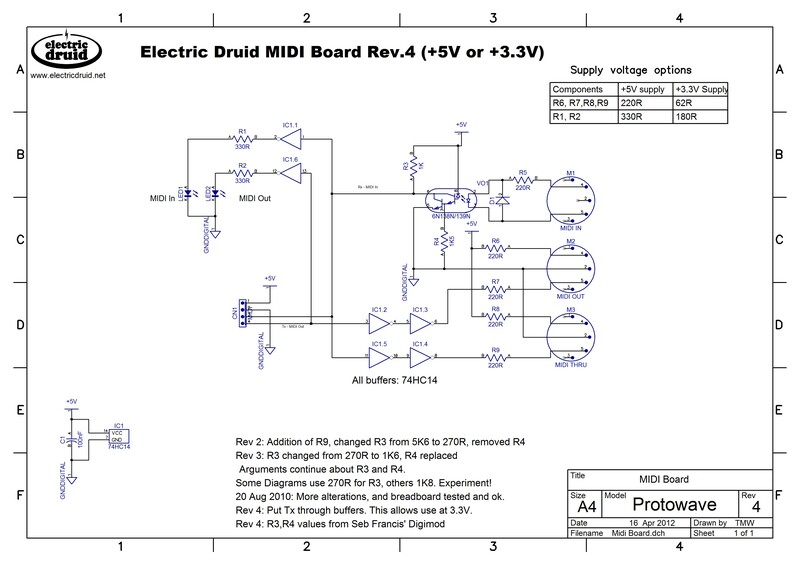 Since all MIDI Inputs are opto-isolated, there's no need for outs or thrus to have optos. In fact, you can wire a MIDI OUT from a processor with just a plug and a couple of resistors. It can be fantastically simple. The IN circuit is always more complicated. You need it for MIDI IN. Take a look at my project, you have a midi in and out already there using a 6n138 opto. With this and 4 resistors you have both midi in and out setup.